My flatmate sent me a bike advertisement that her friend put up on Facebook. It wasn’t quite what I was looking for, but since I was on the site already, I did a quick search. 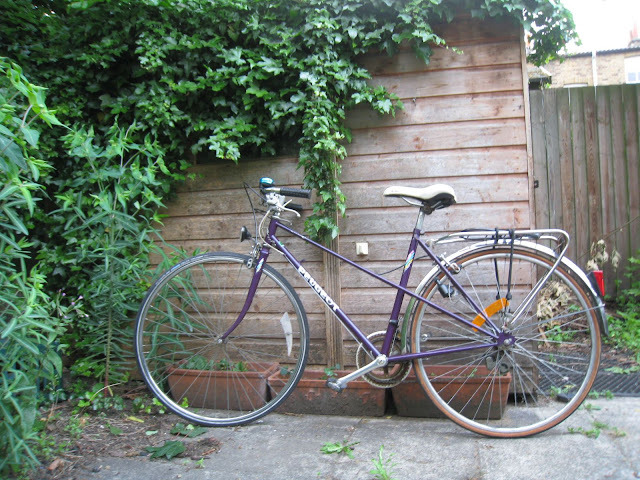 This lil beauty had just been posted and the seller offered to bring it to East London. This solved both the problems I’d been having finding a bike: getting the right size and finding one in a place where I could easily pick it up. He brought it right to my office! After a quick test ride, I noticed the rear brakes were a bit spongy and the gears were a bit sticky, but the wheels were true and the frame was solid. I talked him down. I took it on the train a fair way, to get through central London and then rode from West Brompton. The streets were pretty quiet. It actually wasn’t hard staying on the left at all. I definitely need some more practice to get the balance of this new bike and I need to do some maintenance on it. But I am so happy! The weather was so pleasant riding home. It was quick. It felt good to get a little work out. This is def going to change my perspective on living here. This entry was posted in Adventure, London and tagged bicycle, bikes, cycling, new bike, peugeot, vintage bikes. Bookmark the permalink. I love it! I hope it makes you enjoy your new city even more.